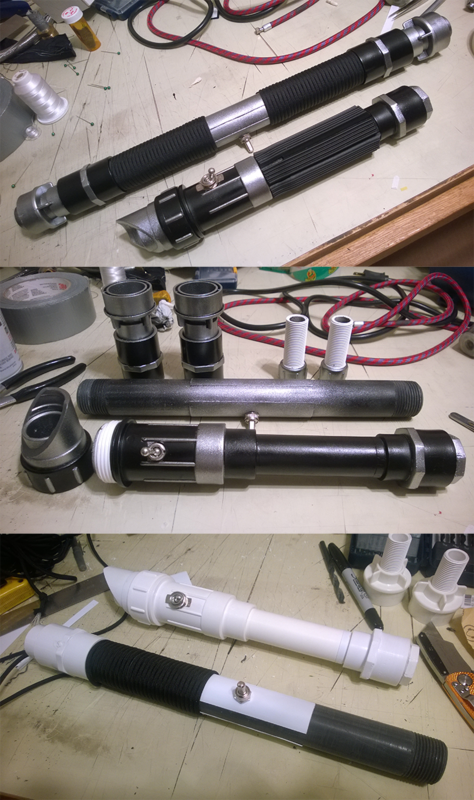 Custom lightsabers I designed for me and my friend before the premier of The Force Awakens. I changed the single bladed lightsaber's grip a little so it looked less awkward towards the top, but didn't get a photo of that version. Love the design of the lower one in the top pic, not so keen on your choice of switches though - there's a lot of good ones available out there from various custom saber places that sit much more flush. Good work on the hilts though! Yeah, we just picked up some switches from the hardware store, they don't look very high tech. They were lost in a fire unfortunately, but I appreciate the tip!